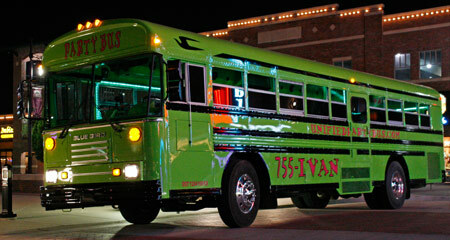 Unified Party Bus was started almost 8 years ago during the time Ivan was working for the Kansas Highway Patrol. Ivan has always loved to have fun however he doesn’t drink. Because of this he was always the designated driver. After realizing there wasn’t a service available to get a group of people around safely and in style while having lots of fun he decided to start a business that did just that. 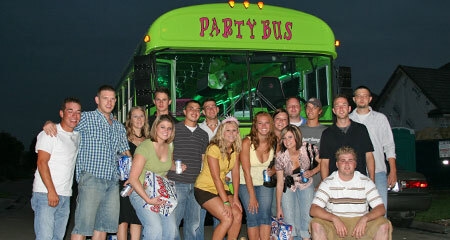 Unified Party bus was started in 2004 with one bus. At the age of 23 Ivan knew he wanted a way for people to have a great time and be able to drink on the bus if they chose, however he didn’t want to go to jail for it. After researching this for quite some time and after filling out pages and pages of paperwork it was officially legal to do just that. After seven and a half years, Unified Party Bus is very proud to be accident free, incident free and has only had to cancel 2 trips because of mechanical malfunctions. One in the winter of 2005 during the ice storm because the bus wasn’t able to make it over the downed power lines in the driveway and once in the winter of 2008 when a steel hydraulic line broke on the way to Hutchinson at 9pm and our 24 hour maintenance company wasn’t able to get the part to fix it. This type of maintenance record is exceptional considering we do over 1200 events each year. I can assure you we were the best company and the only company when we started almost 8 years ago. We are also the best company today and will continue to have integrity and hold our morals high so you will agree we are the best for years to come.